The evening (and the concert) were held as a "do" for graduates of the University of Rochester, the mother college of the excellent Eastman Conservatory of Music. Ms. Fleming is a graduate, as were the throngs of suited and gowned alums gorging on artichoke ravioli, shish-kebabs and of course, an open bar. This reviewer was happily able to join them, in a social prelude to the evening's program of Ravel, Prokofiev and the New York premiere of Letters From Georgia, the new song cycle from the pen of composer (and Eastman grad) Kevin Puts. The student orchesta, under the baton of Neil Varon showed strength and versatility in Ravel's Rapsodie espagnole, that composer's first orchestral work of importance. The expansive and precise palette allowed Mr. Varon to draw on a wide variety of tonal colors: full, robust brass, detailed winds and a versatile percussion section that clattered and clacked in imitation of the swirling skirts and stoming feet of Spanish flamenco dancers. It was an exciting and colorful start. However, the warm applause granted to the Ravel paled compared to the reception given Ms. Fleming. The soprano star is arguably one of the most famous graduates of this upstate New York conservatory, and her cool, slightly aloof demeanor fit these songs perfectly. 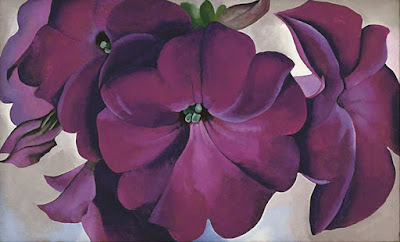 Each of the five songs draws its text from a letter written by Georgia O'Keeffe to her lover Alfred Steiglitz. Played without pause, the songs recounted the painter's artistic and personal journey in stark terms, with Ms. Fleming's soaring voice carrying the narrative forward with detail and warmth. Mr. Puts used a wide variety of styles in these pieces, creating an astringent, arid sound-world that suited the songs' desert settings. Most striking was "Violin", in which Ms. O'Keeffe lamented her inability to play that instrument, punctuated by sharp, gritty tone clusters from the evening's concertmaster. Of the next two songs, "Ache" featured the flaring passion of her affair with Alfred Steiglitz, "Friends" reflected that passions cool with time, leaving room for friendship and the negative consequences of an artist's lonely isolation. The final song, "Canyon" was a kind of liebestod, a transfiguration of the artist on a last walk into a desert landscape that could have been described by the pen of Messiaen. The last half of the concert featured Mr. Varon leading the Prokofiev Fifth Symphony, the World War II-era composition that celebrated the Soviet Union's triumph against the Nazis in uncompromising and patriotic turns. This piece is more beloved by orchestra members than the average listener, as it allows for a kind of flexible virtuosity, showing many instrumental colors to good effect. Notable here was the warm tone of the Eastman cellos, the detail present in the bass clarinet, and the roar of its powerful brass, straining to be let off the lead in the first movement. The second was the most effective here, a three-part scherzo that illustrates the peace and joy of rural life under Stalin, rudely interrupted by the charge of "Germanic" themes in the central trio. The third depicted a barren, frozen battlefield, one of the few times that Prokofiev matched his rival Shostakovich in terms of terse, elegant orchestration. The finale built to a gigantic climax, led with propulsive force and detonating its final brass chords with the enthusiasm and professional skill of a trained fireworks technician.